Yesterday, we looked at right-wing critics writing outgoing UNC President Margaret Spellings’ political obituary. They dismiss her emphasis on making college more affordable for all North Carolinians as “the gaps leftists always complain about” and suggest lower income and minority students helped by lower tuition probably shouldn’t be going to college anyway. 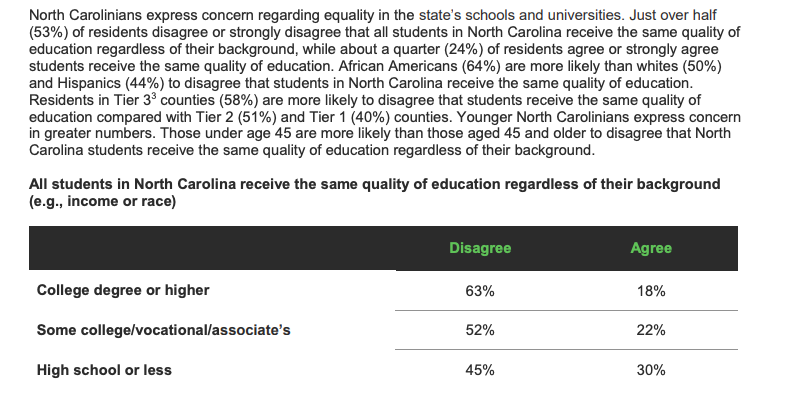 A Gallup/myFutureNC poll released this week suggests a strong majority of North Carolinians disagree with that. Sixty-two percent of residents say it is very important, while 32% say it is important, to pursue higher education, including professional certificates. The importance North Carolina residents place on education is similar to national data from other studies focused on education. Respondents with a college degree (70%) are more likely than those with some college, vocational or an associate’s degree (60%) or those with a high school or less education (58%) to say education beyond high school is very important. African Americans (70%) and Hispanics (76%) are more likely than whites (57%) to say education is very important. North Carolinians also agree on a need to increase the number of people receiving higher education. Sixty-four percent of residents agree that it is important to increase the number of adults with a college degree. African Americans, Hispanics and those with a college education are more likely to agree it is important to increase the number of adults with a college degree compared with white North Carolinians and those with less than a college degree. Residents of North Carolina see education as a key to success as 65% agree that people like them can get ahead by obtaining more education. Spellings and other state higher education leaders, said the results show North Carolinians know the value of higher education and see the wisdom in making it more accessible. Peter Hans, President of the NC Community College System, agreed.